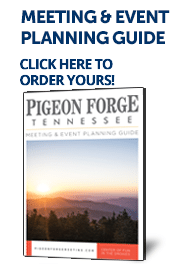 The Pigeon Forge Department of Tourism can assist you with your entire Pigeon Forge meeting and event planning, from a small group of 20 to a larger group of 1,500. We pride ourselves in offering personalized assistance by travel industry specialists ready to go the extra mile for our guests. To start planning your next outing, simply fill out our free online RFP today or contact a member of our Sales Staff.